Our Payment Options include Visa, MasterCard, American Express & Diner’s Club Credit Cards, MasterCard and Visa Cheque Debit Cards via the Industry leading secure Paygate Payment Gateway, I-Pay Real Time EFT. We also offer an easy online credit facility via Mobicred. We also accept Bank Deposit and Regular EFT. Orders made via Credit Card and Real Time EFT will be processed immediately after clicking on Place Order. You will be prompted to follow the necessary steps to securely process your transaction via the appropriate payment method. Your order will be processed on receipt of confirmation from the relevant institution. If the payment was successful then the order will move to the next phase of the process. Orders made via Deposit or Regular EFT will only be processed when the amount appears in our bank account. Please ensure that you use your Order Number as the reference when making your deposit. After selecting    on the checkout page you will be redirected to the Paygate secure payment page where you will enter your card details. The details you need to enter are : selecting the card type, the full card number, the expiry date and the Security Code (CVV), which is the 3 digits in the signature area at the back of your card. For American Express Card Holders the Security Code is the 4 digit number on the front of the card, above the card number. Your details will then be securely processed and you will receive an advice confirming if the order was successful, or if it was declined. If it was declined please check your details and try again if it was necessary to correct anything. Alternately you can enter new card details for any other card you may have, or select an alternate payment method. Pay your order in cash or card as you pick it up at our store. Please ignore shipping costs. I-Pay sends a notification to us on the outcome of the transaction and in turn, we will process your order immediately. There is no need to send through a proof of payment and no need to wait for the funds to reflect in our bank account. is a simple & convenient credit facility that offers you an easy online credit application with an instant response.You will be able to pay for the value of your order in installments of your choosing, if you are approved by Mobicred. 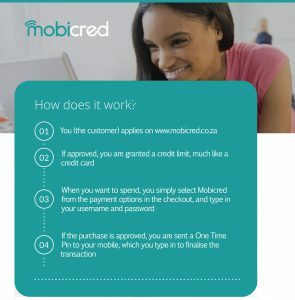 You need to register on www.mobicred.co.za before checkout and then enter your Mobicred login details on the PayFast page that follows checkout. To use Mobicred as your payment method select the Mobicred payment option upon checkout, and then select Mobicred from the resulting page. Follow the on screen prompts to complete your payment on Payfast’s site. Once we receive your payment, we will start processing your order as per our normal procedures.